Just as its name suggests, Chickweed, chickens love this pretty little plant. Not only do chickens like it, but you and the kids might like it when you eat the Chickweed Sandwiches too. This is another great one of our recipes for foraging; perfect for those little taste buds to explore nature a little bit. As a vegetable, Chickweed is tender, succulent and, above all, tasty. We don’t need to heat it up because it is tender. Therefore it is great in sandwiches. In addition, you can also find the plant in all seasons, so it is so easy to make this ones of our recipes for foraging any time of year! Kids can become less active physically in our modern day world because of the lure of screen time. They are perhaps not as interested in the food they eat as they should be; and I’m forgever nagging my son that he needs to eat a “balanced diet”. It has never been more important to encourage children to put down their screens, get outside and engage with nature. 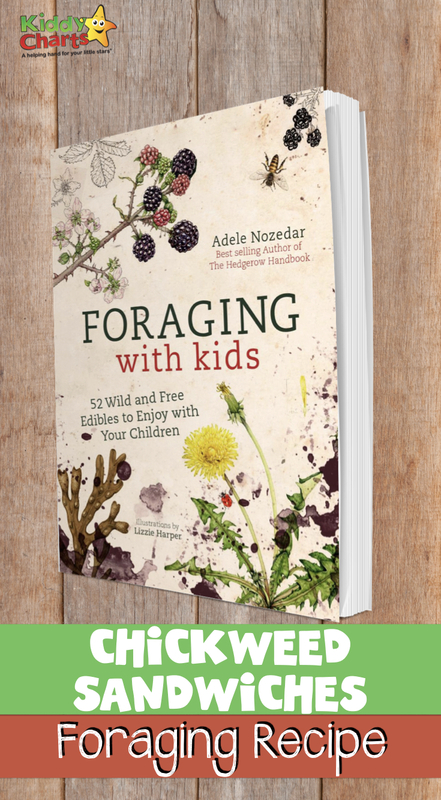 Foraging with Kids will help children to get more active physically and offers an opportunity for them to become more interested in the food they eat. If you’ve found the food you’re going to have for tea – why wouldn’t you be interested in it, right? Today we would like to share this Chickweed Sandwiches recipe with you, which we have adopted from the Foraging for Kids book which is launching on 20 September 2018. You can create several of these recipes for the whole family members. Make a hard boiled egg in 5 minutes. Put the egg into a small saucepan of cold water, making sure there’s enough water to cover the egg. Add a dash of vinegar. Transfer the cooked egg to a bowl of cold water using a slotted spoon to cool it down after turning off the heat. Dry the egg with a paper towel, when cool enough to handle. Crack and peel the egg shell off. Put the peeled egg in a bowl. Mash with a fork. You can add a dollop of mayonnaise if you like. Fold in the fresh chickweed and sprinkle with salt and pepper to taste. Butter the bread, then spoon the egg and chickweed mixture onto one slice. Pop the second slice on top and cut in half. Eat! How does it sound? Hmmm, yummy. Then, you will need to try it for yourself! Foraging for blackberries from The Gingerbread House. Please don’t forget to follow us on Pinterest for lots more great ideas, and if you like this article why not subscribe to our weekly newsletter too? Mango Salad is another great taste for the kids, and they can even help make it as well! Thanks for joining us, and see you again soon, I hope.